For perfect visibility in any conditions, choose Volkswagen Geniune Aero Wiper Blades. Please note: Screenwash and Window & Display Cleaner is not included as part of the Rear Wiper Blade pricing. 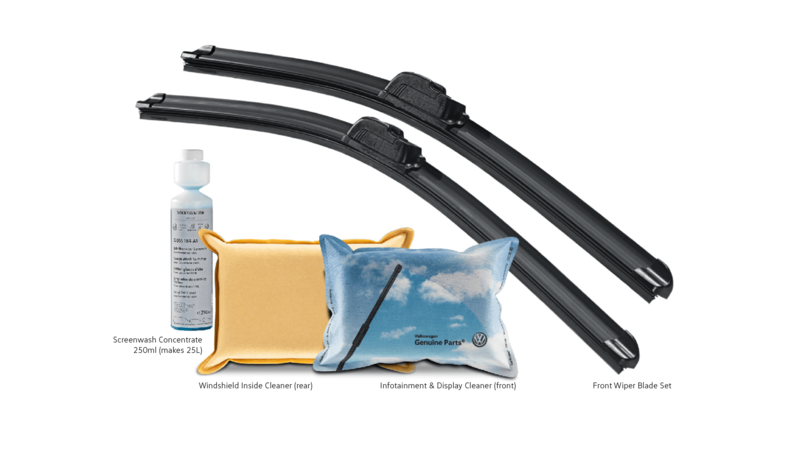 *Front Wipers: Manufacturer‘s recommended campaign price available at participating Volkswagen dealers until 31 January 2019. Price includes one pair of Aero wiper blades, 250ml screen wash, window and display cleaner, fitment and GST. This offer applies to selected Volkswagen models including Golf MY 2003 onwards, Golf Cabrio MY 2012 onwards, Polo MY 2005 onwards, Tiguan MY 2008 onwards, Passat MY 2006 onwards, Passat CC MY 2009 to MY 2012, CC MY 2013 onwards, Arteon MY 2018 onwards, Jetta MY 2006 onwards, Scirocco R MY 2009 onwards, Beetle MY 2012 onwards, Eos MY 2006 onwards, Up! MY 2012 onwards, Caddy MY 2004 onwards, Transporter/Multivan/Caravelle MY 2013 onwards, Amarok MY 2011 onwards, Crafter MY 2006 onwards (includes New Crafter~ MY 2018), Touareg MY 2011 onwards. ^Rear Wiper: Manufacturer‘s recommended campaign price available at participating Volkswagen dealers until 31 January 2019. Price includes one rear Aero Wiper Blade, fitment and GST. This offer applies to selected Volkswagen models including Golf MY 2003 onwards, Polo MY 2005 onwards, Tiguan MY 2008 onwards, Passat MY 2006 onwards, Touareg MY 2011 onwards, Scirocco R MY 2009 onwards, Up! MY 2012 onwards, Transporter/Multivan MY 2003 onwards, Caddy MY 2004 onwards, Crafter MY 2006 to MY 2017, New Crafter~ MY 2018 onwards (left and right hand side). *^Not available in conjunction with any other offer. Volkswagen Group Australia reserves the right to extend, withdraw or change all offers.